This is matured in ex Bourbon barrels and the PPM level sits at 20. Nice subtle peat in the smell. Some pears and apples but nothing too sweet. Actually it is very light considering the ABV at 50, and not much is going on. The peat is the first thing to hit the palate. Then some vanilla and hints of exotic fruits in the background. Just a touch! Pineapples and coconut. 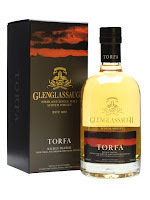 In the finish I get some grass that mixes with the peat and a little wood and spices. Some light citrusy notes is present from smell to finish. Fine dram, fine balance, but I miss some complexity. It tastes young, but the peat makes up for the missing flavours you normally get from longer maturation. Can’t wait for Glenglassaugh to make some older peated versions! I will give this 82/100 (20/21/21/20).